If autonomy is to prevail then it should be an autonomy within a fully and strictly democratic Morocco, and if confederation is to prevail then a confederation within a fully and strictly democratic Western Sahara. Farouk Batiche/AFP/Getty Images. 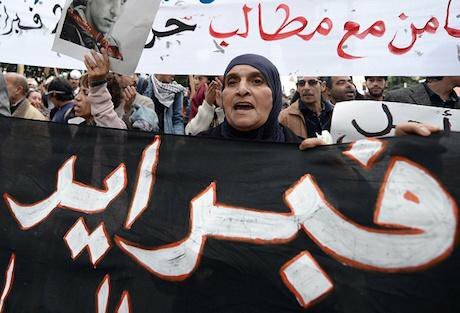 All rights reserved.Some claim Morocco's 20 February protest movement has largely failed as a transformational social movement capable of articulating an alternative discursive and coherent challenge to the regime. They say that a striking constant feature of the movement was its fragmented centrifugal leadership and horizontal mobilisation. These observers are correct in claiming the protest movement did not manage to articulate a strong alternative discourse to that of the monarchy, especially in its traditional and religious appeal. However, they fail to correctly assess what they describe as the ideological fissures that amplified the 20 February movement's weakness. Indeed, the fissures are not only those between radical leftist Marxists and the banned Islamist al-Adl wal Ihsane, but also predominantly between the annexationist nationalists (PSU) and the separatist internationalists (pro-Polisario voices), via the Islamist neutralists (AWI). More importantly, the critical fissure is not between diverse philosophical orientations but one between ideologies as such and a strictly pro-democratic politics. This normative approach to the Western Sahara conflict is largely inspired by the political theory of John Rawls. Since the international community cannot realistically guarantee political self-determination for the Sahrawi population, I argue they should be at least guaranteed maximal political democracy in whatever outcome of the current conflict. I am not pleading for self-governance in the sense of true autonomy or true confederation. Nor do I claim some global individual right to democratic self-determination as distinct from an internal or collective self-determination. Leaving the options relatively open, I ask for much more: if autonomy is to prevail then it should be an autonomy within a fully and strictly democratic Morocco, and if confederation is to prevail then a confederation within a fully and strictly democratic Western Sahara. I am not suggesting the Sahrawis should give up on their hope for freedom, only that they should think along different lines and make the best of a situation where the justice of international law is stubbornly refuted by French and US geo-strategic concerns. 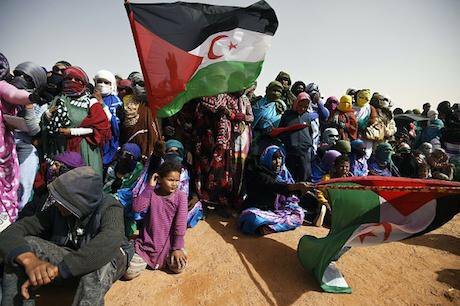 The international community should make the present stalemate work for a democracy owed the Sahrawi people, give them a push in the footsteps of democratic Tunisia, so they do not have to be ruled by an authoritarian regime, be it theocratic or military. The suggestions to follow are not about simply trading freedom for democracy; they aim at favouring democratic freedom over undemocratic freedom. The idea is to have opposite wills to freedom work for democracy, and to have democracy promotion depend on rational hopes for next-best freedom and rational fears of the worst unfreedom. I first argue it is for the UN Security Council both morally defensible and politically feasible to promote a pro-democracy approach in the Western Sahara conflict. I then turn the political culture of the Arab uprisings against the geo-strategic argument and draw on Rawlsian insights to outline context relevant characteristics, principles, and values of constitutional democracy. Also, comparatively with all other options – integration (1), separation (2), autonomy (3) and confederation (4) – democracy promotion (5) is fairer and more rationally satisfying. In a hypothetical contractual situation, a political-constructivist thought experiment where actors do not know whether they represent Moroccan or Sahrawi nationalist interests, options (1) and (2) would be ruled out in favour of options (3) and (4) insofar as the latter minimise the risk of complete or partial loss of national identity. Likewise, options (3) and (4) would be ruled out insofar as their implementation would be a risky business and would amount to gambling with the high stakes of identity. Indeed, under a veil of ignorance, there is no way for us as nationalist choosers to rationally scale the best and worst solution: autonomy can prove catastrophic if we find ourselves Sahrawi nationalists, and confederation can prove catastrophic if we turn out to be Moroccan nationalists. There is no way to non-metaphysically, impartially and justly assess which of the two catastrophic outcomes is less catastrophic. Farouk Batiche/AFP/Getty Images. All rights reserved.Only the contest for democratic status (5) offers a way out, one that is both heroic and civilised at that. To the contending nationalist it offers the possibility to defy chance and master fate; the possibility to fight for one’s cause by new means. To both identity narratives it offers a common neutral ground or strictly political arena. And to the region as a whole it offers the possibility of stability, legitimacy and overlapping consensus. To be sure there is yet no international consensus on a human right to democratic governance; only some consensus on the instrumentality of democracy for human rights exists. However, democracy promotion, as with human rights, is undeniably in line with contemporary progressive trends in international law and the normative shift involving intrastate peacekeeping activities. Since the end of the Cold War, the UN’s democracy promotion practices have been developing in the form of electoral monitoring, post-conflict missions of international administration (Kosovo, East Timor, Eastern Slavonia), rule of law initiatives, and linking democracy to conflict resolution. Some lesser degree of democracy promotion already has quasi-international legal support. Thus, for the European Parliament, “internal self-determination…refers to the right of peoples freely to determine their own political system, while at the same time respecting the principle of territorial integrity, and to participate in the political life of the state.” In the same vein, Charles Beitz’s notion of ‘a human right to collective self-determination’ is less controversial, legally speaking. This notion, he says, is less demanding than the requirements of either democracy or political justice. Clearly, objections to the requirement of a full human right of democratic governance are two: the weak correlation between democratisation and economic development and the diversity in global political culture. Democratisation should promote a political space the constitutional and justice principles of which lie above a universal normative floor, yet beneath local cultural ceilings. A similarly cautious sense of democracy promotion is supported on straightforward moral grounds. According to John Rawls, developed countries owe developing countries a “duty to assistance” in the development of decent institutions. Rawls’s recommendation resonates with the UN Millennium Declaration, promoting effective domestic institutions and a “governance that is based on participation and the rule of law, with a strong focus on combatting corruption”. In Rawlsian language, democratic governance as such is no human right, and even less an “urgent” right, but in strict compliance with standards of political ‘decency’ he instead considers an imperative of “the law of peoples.” As for the sort of (maximal) democratisation he promotes, this is predicated on considerations of public political culture and made on a case by case basis. Objecting, proponents of international realism ask whether democracy is not bad for stability. The International Council on Human Rights Policy, for example, referred to a clash between “conflict managers” and “democratisers/human rights activists”: “The former see peace as a precondition for democracy, the latter see democracy as a precondition for peace.” However, current “conflict transformation” research says there is no more clash between human rights advocates and conflict resolvers than between justice and peace. In fact, the correlation between democracy and peace has been significant since Kant made his claim about the peaceful nature of republics. With Rawls came the international theory of democratic peace; the hypothesis that democracies are less likely to engage in war except in severe cases to protect human rights, eventually extended to include the thesis that decent societies, if admitted to the international community, would pose no special threat to the stability of such a community. For Rawls, democracy (or decency) is desirable for the sake of long term stability, both domestic (intrastate) and international (interstate). “Stability for the right reasons” serves long term allegiance to agreed upon principles of justice, unlike modus vivendi stability and a temporary balance of forces. In sum, a pro-democracy approach is desirable, provided that maximising democracy stays within a reasonable range of variation: democratisation should promote a political space or ideologically neutral arena, the constitutional and justice principles of which lie above a universal normative floor, yet beneath local cultural ceilings. In cases like the Western Sahara dispute, it should use the means of autonomy and confederation to permanently provide the necessary space for identity achievement and pluralist toleration. It should be open-ended and provide for either side the possibility of “updating” their democratic status. It should show that periodic alternation between autonomy and confederation – more than one tournament – is not a merely theoretical possibility. Democracy promotion should be capable of showing that the irreconcilability of nationalist narratives is not an insuperable obstacle. It should be capable of turning the antagonistic claims of Moroccan annexationists and Sahrawi separatists into a peaceful and civilised competition for democratic status. It should do so especially to guard against dangerous regional imbalance, namely if an unqualified Sahrawi independence should only mean economic and military dependence on Algeria, and to deal with the worst-case independence scenario, one that triggers an uncontrollable explosion of aggressive Moroccan nationalism. Is a pro-democracy approach politically feasible? Well, should the Security Council agree to and vigorously endorse an arbitrator role, this would trigger a new process. This would allow new players to jump into the game: civil society actors such as the pro-democracy 20 February movement in Morocco and the protesting Sahrawi youth in the territories under Moroccan rule. This would make possible deals of a different sort. There are indeed good reasons for different and informal potential representatives of the parties to the conflict to accept a pro-democracy version of the 2003 Baker Plan. Fadel Senna/AFP/Getty Images. All rights reserved.As a reminder, after he agreed in 1997 to mediate the dispute, former US Secretary of State James Baker proposed a plan that envisioned Sahrawi self-rule under a Western Sahara Authority for a period of five years, with a referendum on independence to follow. According to this plan, the entire present-day population of Western Sahara was to participate in the final referendum, including the Moroccan settlers who immigrated after 1975. The plan also provided that the interim government (the Western Sahara Authority) could only be elected by a voters' list restricted to persons identified as original inhabitants of the territory. In July 2003 the UN Security Council endorsed the plan and unanimously called for the parties to implement it. The Polisario Front and its main backer, Algeria, reluctantly accepted it as a basis for negotiations. But then Morocco rejected it, saying that it would no longer agree to any referendum that included independence as an option. After Morocco directly protested to France and the United States, Baker lacked the necessary support from the Security Council to implement the agreement – the 1991 Settlement Plan – between the Polisario Front and Morocco on the organisation of a referendum. Baker's seven-year engagement was sabotaged as geo-strategic concerns took over, including Morocco's cooptation as an ally in the American war on terror. 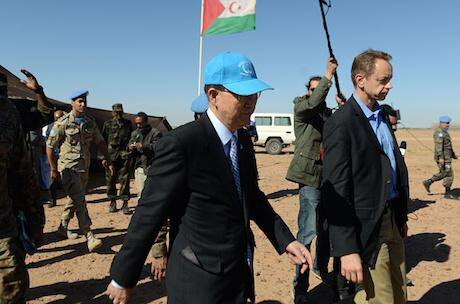 In 2004, Baker became the second UN envoy to Western Sahara to resign. Baker’s plan was long dead when in 2007 Morocco proposed autonomy for the territory as a final solution to the conflict. But the proposal, which was unsurprisingly backed by France and the United States as being “serious and credible,” raised serious objections. Expert Stephen Zunes, for example, cites the cases of Eritrea and Kosovo to emphasise that “centralised autocratic states have rarely respected the autonomy of regional jurisdictions, which has often led to violent conflict.” For Zunes, autonomy within an authoritarian regime is unlikely, particularly when the autonomy proposal indicates that all powers not specifically vested in the autonomous region would remain with the kingdom and that the Moroccan king would retain all constitutional and religious prerogatives. Zunes is correct. The autonomy proposal insists the Moroccan state will keep exclusive jurisdiction over the royal domains, and not only with respect to defense and external relations but also with respect to “the constitutional and religious prerogatives of the King.” Zunes is equally correct that the King in Morocco is ultimately invested with absolute authority under Articles 41-42 of the new constitution. It is even safe to say that the constitution and Islam are what the King says they are. An instrumentalisation of nationalist rivalry will only benefit a pro-democracy race and a pro-peace escalation. Now, unlike in the Baker Plan, the test period proposed here is not a trial in self-governance but in achieving democratic status. It is an experiment in a transition to democratic governance conducted in direct challenge to current Moroccan autocratic governance. Nor is it quite a trial in confederal association, since the experiment is meant to be conducted under UN auspices and strict international supervision. However, the experiment may usher in a phase of straightforward confederation, if by the end of the trial period, the Moroccan side cannot provide a democratically more convincing (autonomy) alternative than what may have been already scored under the interim Sahrawi authority. Unlike the Baker Plan, this proposal leaves it to a UN special authority to arbitrate (meaning binding arbitration) the territory’s future status – autonomy or confederation – once the experiment is completed. The proposal does not stipulate any independence referendum, nor does it presume any historic sovereignty over the territory. Instead, it assumes at the start a Sahrawi renouncement of the referendum as well as the replacement of the Moroccan military-security forces with international ones – with new peacekeeping duties. As for the entire issue of whether or not the settlers should vote and whether or not they should participate in the steering as such of the experiment, this is an open question. Also, these suggestions are fundamentally different by being non-governmental and by engaging non-officials in dialogue. They are different because they form part of an informal diplomacy of a specific kind; an inter-public diplomacy of exchanges between private citizens and non-state actors on both sides. The proposals are different because they aim to influence public opinion, impact civil society, and promote domestic change, all that in defiance of governments on either side. Lastly, there are four main reasons for the Moroccan and Sahrawi publics to favour a pro-democracy version of the Baker Plan: (1) The proposed version offers both parties a long-term fully open-ended solution to the issue of national identity; namely, the possibility of autonomy and confederation alternating through more than one tournament and with no either/or final outcome. (2) As a worst case short term outcome, the pro-democracy wording offers either of the two parties a comforting and honourable way out: autonomy for the Sahrawi nationalist and confederation for the Moroccan nationalist. (3) As a best case short term outcome, it offers them reasonably attractive gains: confederation for the Sahrawi nationalist and autonomy for the Moroccan nationalist. (4) Whatever the outcome, it offers a guaranteed improved democratic status: autonomy within a democratic Morocco or confederation with a democratic Western Sahara. Thus an instrumentalisation of nationalist rivalry – a combination of the opportunity/risk of an autonomous Western Sahara within a sovereign Morocco and the incentive/threat of a Moroccan-Sahrawi confederation – will only benefit a pro-democracy race and a pro-peace escalation. Clearly, the crux of implementing such a “plan B” is the notion of democracy. What would an outline of democracy indices would look like, when grounded in public political culture? Fadel Senna/AFP/Getty Images. All rights reserved.On Rawls account, “decent” status assumes a society ideally tied together by a homogenous view of a given common good. Notwithstanding official propaganda, however, this is not the case for Morocco, nor for most historically existing social formations for that matter. 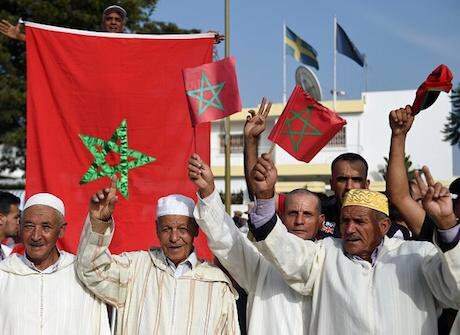 Given Morocco’s hybrid secular-religious culture and given the diversity of conceptions of an Islamic common good in civil society, the Moroccan polity cannot even be candidate for “decent” status. We must not forget, the politically excluded al-Adl wal-Ihsan is in fact the country’s largest religious opposition. In other words, any autonomy plan for the Western Sahara that assumes a theocratic or unitarist-confessional legal order is from a Rawlsian point of view out of the question. More than that, should a given regime’s perfect “uni-confessionality” be attested, this alone does not suffice to earn it the “decent” status. As said, by Rawls’s analytic standards, Moroccan style societies are too atypical to deserve an exemption from state-religion separation, or permission to have anything from Sharia to a Commandery of the Faithful enshrined in their constitutions. Such a “decent” status also requires a “sufficient” measure of freedom of conscience, as well as full freedom of religious factionalism and political dissent. Then and only then, when societies meet such decency requirements, do they qualify as candidates for “democratic” status and may they contest for best ranking. The question is whether the Security Council will find the will to address civil society in support of democracy in Western Sahara. Now for qualified confederation and autonomy plans to be competitive with each other in an agreed-to pro-democracy race, they need to be maximally faithful to the aspirations of the 2011 uprisings and the public political culture of the Arab Spring. This would include the principle of the civil state as sanctioned in Tunisia’s new constitution, and the privatisation of the Commandery of the Faithful as hoped for by the 20 February movement in Morocco. The entire enterprise would imply rating progress, from floor to ceiling levels according to scales of some sort, toward essential elements of constitutional democracy. In what concerns characteristics and principles of constitutional democracy, the potential settlement plans will have to rise higher than, say, formal rule of law, independence of the judiciary, power-wealth separation, accountability, constitutional design, and electoral democracy. They should aim at substantive rule of law, separated powers, transparency and publicity, parliamentary process, and beyond mere majoritarian democracy. As for the fundamental values of constitutional democracy, the proposals will have to go beyond the most “urgent” human rights Rawls requires decent states to respect: the right to life, freedom from torture, social minimums, etc. They should instead line up with the 2011 protesters’ demands for maximal human rights: the right to full freedom of conscience and related freedoms, including all sorts of socio-economic rights. Also, they will have to advance from basic political participation rights to a full right of democratic governance, from ummah communal or national sovereignty to popular sovereignty, and from basic freedom of political dissent to citizenship proper. For a pro-democracy plan to work in Western Sahara, the willingness of the official conflict parties will not be an issue; only the willingness of the Security Council and regional civil society is crucial. The implementation of such an experiment will require the backing of the international community. The question is whether the Security Council will find the will to address civil society in support of democracy in Western Sahara. As for France and the US, in the name of stability and security they will certainly go against any such democratic change. But once the Arab Spring is triggered anew, would they be able to stop it?